As returning Century students know, the school has recently closed off the hallways that were previously open during lunch. This is one of the causes contributing to amount of students in the cafeteria. Although outside and upper central is open to students during lunch, the weather is getting colder which will discourage students from going outside. Upstairs Central gets very crowded during lunch as well due to many students hoping to escape the packed cafeteria. Although the school had their reasons for closing the halls, it has made lunch for students less enjoyable. Many students struggle to find an open table or even chair in some cases. Looking for a place to sit takes away from their actual eating time, which leaves students either unable to eat, or eating in their next class instead, which can be distracting. “For example, I may be talking to my second period teacher in south and my next class is in north, and I’m walking to my class and the doors are locked…now i’m angry and even later than anticipated.” Both these pros and cons should be taken into consideration when discussing possible changes and the overall well being of the students. The colder months will also bring in the students who usually sit outside, which adds to the chaos in the cafeteria. In order to avoid this, the school should make changes to make the students’ lunch experience more enjoyable. Crowded lunchrooms may not seem like a big deal to some, but for many students, lunch is the only break they get throughout the day. Because of this, the school should try to make it as enjoyable as possible. Although the school has their reasons for closing off the halls, there are alternatives to keeping them open. For example, opening further into South and North main halls, but not allowing students to go into the connecting halls where the majority of classes are. 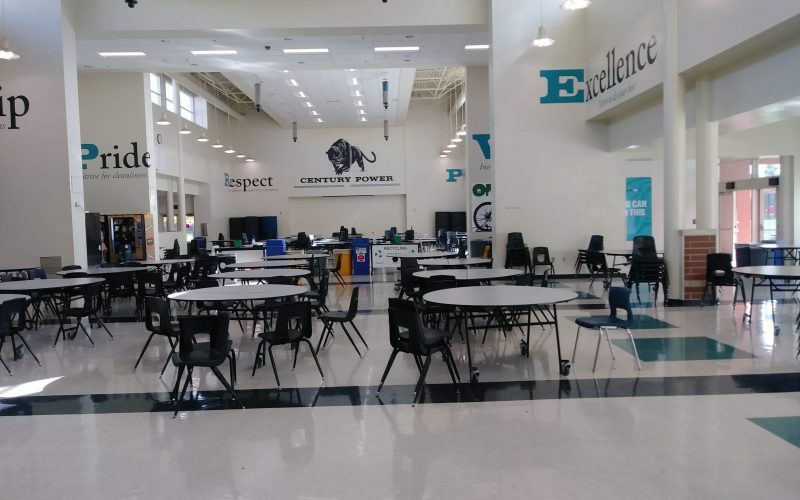 This brings us to the question of, “What if they do disrupt classrooms?” If multiple complaints are made of students at lunch disrupting classrooms, the privilege would taken away once again. However, it seems that students have seen what it’s like not having the halls open, they’ll be more inclined to have and enforce better behavior to keep it that way. The school currently has 52 tables set out for each lunch. These tables can hold a maximum of 7 chairs around the table, which leaves an average of 6 chairs around each table. If half the school has each lunch, that means an about 700 kids have lunch together. With 312 chairs at lunch, it leads us wondering what the remaining students do for lunch. Some students prefer having their own personal space, but with the condensed amount of people in the seating option areas makes this extremely difficult. As previously mentioned, many options are available that can help better the well-being of Century students for the rest of the year.